Why get a muffin pan? The most basic function of a muffin pan is to ensure perfectly round, perfectly-risen muffins with muffin tops every time you bake, and that is why most of us get them. But muffin pans do more than that; they are versatile tools, and you can use them to make everything from buns to egg sandwiches and of course, cupcakes. The right muffin pan also makes all the difference in how well your muffins and cupcakes rise, bake and brown. So, to help you make sense of the many models out there and find a muffin pan you can rely on for regular Muffin Perfection, we went ahead and reviewed the best muffin pans on the web, seeing how well they stack up against each other. What are the Types of Muffin Pans? As is the case with most cookware, muffin pans are regularly made of a variety of metals. Aluminum: Aluminum is the most common muffin pan material. It’s a good conductor of heat and does a fine job at distributing heat evenly from the pan to the baked goods inside. The result? Perfect, evenly-cooked baked goods. Aluminum’s main downside is its strength; it’s easily dented and has the propensity to warp when subject to rapid temperature swings. Stainless Steel: Stainless is – like aluminum – very popular. Unlike aluminum, however, it’s very, very strong material – even more resistant to warping.Stainless steel is much easier to clean, too – though most come with a non-stick coating. It’s a bit slower at conducting heat, too, so your muffins might not cook as fast or rise as much. Steel: Muffin pans made of regular steel are some of the sturdiest of the bunch. Most come with a non-stick coating so sliding muffins out easily and intact is easy. Carbon Steel: Carbon steel is a steel and carbon alloy – which means it’s one of the lighter and stronger materials of the bunch; it’s naturally non-stickwhen properly used, cleaned and seasoned, too. 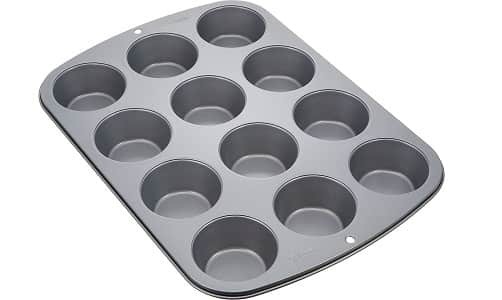 Non-Stick Muffin Pan: Well, as the name suggests, a non-stick pan is the one that will prevent the batter of the muffin to get accumulated on the surface of the pan. Most of the people will prefer the non-stick variety of the muffin pan. This can be made from several materials including aluminum, steel, amongst others. What’s Wrong with Silicone Pans for Baking Muffins? 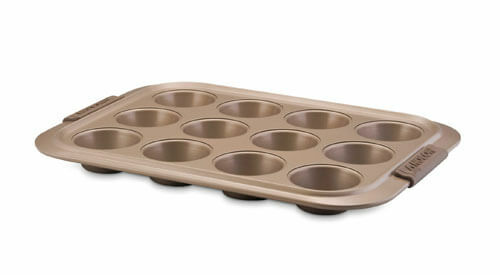 Silicone muffin pans are popular with bakers, as many love how easy it is to simply pop muffins out of a flexible tray. Silicone is non-stick and can be mixed and formulated to get as close to the conductive properties of aluminum or steel as possible. Still, we don’t recommend it – for several reasons. Even at its most conductive, silicone doesn’t do a great job of radiating heat evenly throughout the muffins, and they won’t rise or bake as well as they should. The soft shape of the silicone cup can also lead to malformed muffins; they won’t form that perfectly-rounded muffin top but instead spread out. Believe it or not,the color of your muffin pan influences how your muffins turn out. Lighter-colored pans result in lighter-colored muffins, while darker pans create muffins with more browning. Bronze or gold pans create muffins browned somewhere between the two. Why? For the same reason a black car gets hotter than a white one while sitting in the sun,or why you shouldn’t wear black outside on a hot day; darker-colored objects absorb more heat than lighter objects, while white reflects heat and stays cooler when things start to heat up. As a result, darker pans subject the muffins to more heat than lighter ones, creating browner, often thicker crusts and edges in the process. Very dark pans might burn some edges on high heat. Darker and lighter pans also create different muffin shapes. In a darker pan, the batter on the edges sets faster and the rest of the batter rises upward, often creating larger, wider muffins that rise out of the cup. Lighter pans cook a bit slower, but create rounder, more uniform muffins. This applies when using muffin liners (baking cups), too; whether it’s stainless steel or aluminum, light or dark, each pan’s properties work right through the paper. The real question is – does it really matter? Not really – it’s just a matter of personal preference. If you like your muffins to have some crust, get a darker one. If you don’t care, then it doesn’t matter. What About Muffin Top Pans? What’s so Cool About Them? Muffin top pans let you easily bake everyone’s favorite part of the pan – the crispy muffin top – without bothering with the rest. If that’s all you want, you might be happy with just a muffin top pan; they also work for baking burger and sandwich buns. OXO Good Grips Non-Stick Pro is our Top Pick for a good muffin pan. Why? Because it’s solid, easy to release and clean, and reliably bakes perfectly-browned and delicious muffins. 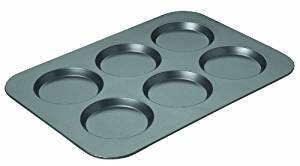 It comes various cup sizes –from large muffin pans to small ones – if you’re looking for the best muffin pan possible, you can’t go wrong with this one. It’s made from heavy-gauge, aluminized steel. It conducts and distributes heat evenly, is thick and durable, and bakes muffins to a perfect golden-brown. There’s a two-layer, ceramic-reinforced non-stick coating. Muffins release easily and pop right out of the pan.The coating is also resistant to corrosion and scratches. The micro-textured, non-stick pattern reduces surface contact and increases airflow for even baking. Oversized, square-rolled edges around the perimeter of the pan make it easy to grab. It’s not dishwasher-safe. We’ve seen it advertised as such on some sites, but hand washing is recommended to preserve the non-stick coating. Rust sometimes forms under the curled lip. Make sure it’s dry before putting it away. Analon’s 12-cup muffin pan sounds like it’s made of Bronze, but it’s carbon steel with a bronze finish. This combo browns muffins better than lighter pans but doesn’t create the dark crusting that other dark pans sometimes do. Carbon-steel is light yet durable. It does a good job of conducting heat and transferring it throughout the entire muffin, while staying warp-resistant. The non-stick coating makes for easy release of muffins and cupcakes. The bronze color finish gives them a good medium browning every time. Rubberized SureGrip handles are there for easy grabbing and lifting, straight out of the oven. It’s oven-safe up to 450F and dishwasher-safe. It rusts. Be sure to dry it out before putting away. Do your favorite cupcakes and buns come out with over browned bottoms in your existing pan? The pan’s darker color results in brown, crusted muffins, and the steel construction is tough yet lightweight. The Wilton Results pan is a good choice on a budget. The non-stick surface makes it easy to pop muffins in and out of the tray. It’s dishwasher-safe and doesn’t flake off like other coatings. Oversized handles help when grabbing it and pulling out of the oven. It’s very light (11.2 ounces) – despite the durable steel build. The darker color browns muffins perfectly. They rise fully and come out with great crowns on top. The handles aren’t large enough. This a heavy-duty muffin pan for serious bakers who expect longevity from their cookware; it’s made from a super-solid alumized steel and feels like it’s built to last a lifetime. It also has corrugated design for proper air circulation, quick release, and even baking. It is made by Bundy Family Company which manufactures top quality bakeware in the USA. It is made for socially and environmentally conscious bakers. The AMERICOAT coating makes this pan BPA, PTFE, and PFOA free. 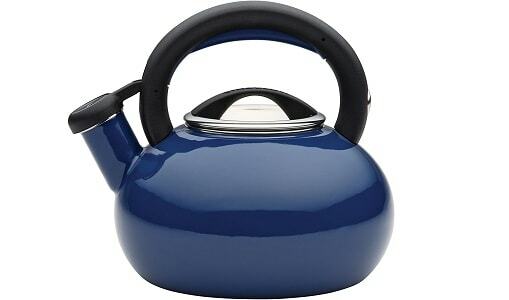 It is made of 65% recycled steel which has lifetime warranty and is safe for environment. If you don’t like your baked good swell-done, however, you may want to opt for another pan. The heavy-gauge alumized steel is seriously-sturdy. You can feel the heft when you pick it up. The corrugated designhelps reduce surface contact while increasing airflow. An AmeriCoat Plus Silicone Nonstick Coating makes cleanup easy. This coating is PTFE and PFOA-freeso your food doesn’t encountertoxic chemicals. It’s Made in the USA comes with a Limited Lifetime Warranty. It sometimes over-browns the muffins. Steel isn’t the best conductor – compared to iron or aluminum – and occasionally burns edges. All you want is some perfectly crusted muffin tops, without the rest of the muffin underneath? Get his 6-cup muffin-top pan. Small, light and effortlessly non-stick, baking perfect muffin tops every time. The heavy-duty alumized steel is lightweight yet sturdy and does a solid job of distributing heat evenly throughout the pan. It has a Whitford Xylon non-stick coating. Food releases easily and the pan is super easy to clean up. The cups have curved edges, for smoother baked edges. The pan itself has thick, curled edges for warp-resistance and easier grabbing. The cups are shallow. It’s easy to overcook muffin tops, and you might want to use lower heat. This is one of the most popular muffin pans circulating around the web, and for good reason; it’s inexpensive, durable and bakes golden brown muffins every time. It’s carbon steel -thick and heavy duty, yet light. The non-stick coating works. Muffins and other foods are easy to release and leave behind no mess. It also doesn’t flake. There are orange silicone handles on each end;you can easily and securely grab onto the pan when pulling out of the oven. It rusts after a while. We can’t tell if it’s dishwasher-safe or not. 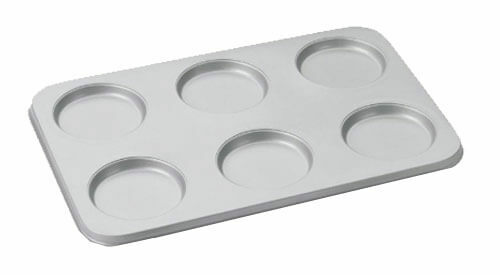 This is another popular muffin top pan, made from even-heating and heavy-duty carbon steel. It’s basic but bakes perfectly browned muffins every time. The carbon steel and dark finish help create good browning. The material is also warp-resistant but light enough to easily carry and move around. The non-stick coating keeps those muffins or buns from stick and makes cleanup easy. It comes in 6-muffin, 12-muffin and 24-muffin sizes; whether you do a lot of baking at once or just a bit, there’s a size you’ll like. The metal is thin and dents easily if dropped or banged. The non-stick coating bubbles and peel off over time. The cups have flared edges, which often results in unevenly-shaped muffin edges. Like the ease of a non-stick pan but don’t like the chemicals those coatings use? 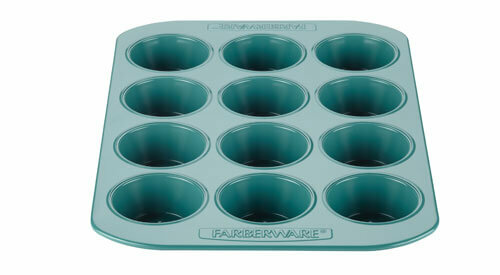 Farberware’s muffin pan uses a natural ceramic non-stick coating to create an easy-release pan without the chemicals. The steel core heats up evenly and is resistant to warping and breaking. It bakes beautifully. Muffins come out perfectly round and browned, with perfectly-round tops. The non-stick ceramic coating contains no PTFE’s or PFOA’s. It’s safe and non-toxic. Baked goods release easily. The muffin cups have “quilted” bottoms. This improves airflow to make for even baking. Rolled rims add durability and strength,and the ends are wide enough to use with oven mitts. 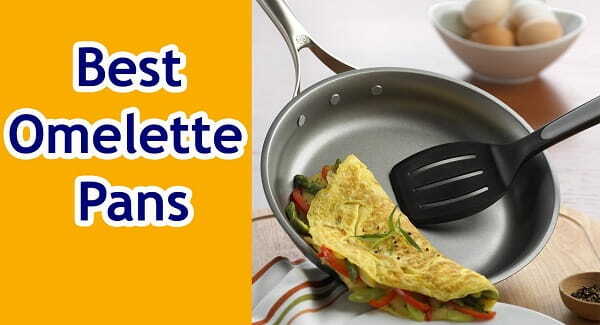 The non-stick coating loses effectiveness over time. If you don’t like non-stick coatings, Nordic Wear’s Natural Aluminum Muffin pan might be what you’re looking for. Built from 100% pure aluminum, it bakes perfectly muffins with excellent light browning and without non-stick chemicals. The aluminum build conducts heat evenly and muffins rise completely. An encapsulated steel rim prevents warping at high heats. It’s made in the USA and you can feel the sturdiness and high-quality. Nothing sticks. Use a bit of spray or oil and the muffins will pop right out, even without a non-stick coating. The light color aluminum may require longer bake times than darker pans. The edges are not large enough to comfortably pull out of the oven.This goes especially when wearing oven mitts. Baker’s Secret’s 12-cup non-stick muffin pan is a popular one, and for good reason: it’s high quality and inexpensive to boot. This makes it a top choice for Walmart who has done well selling them over the years. It also comes in multiple sizes; 6-cup, 12-cup and 24-cup. A 2-ply steel build is durable and radiates heat evenly. The non-stick coating is excellent at releasing muffins and doesn’t require much cleanup. Muffins come out perfectly. There’s a bit of browning and perfectly-round tops. It’s dishwasher and broiler safe. The non-stick coating scratches easily. Don’t use metal utensils if you want to keep it from flaking off into your food. Baker’s Secret includes a 5-year limited warranty. Some people don’t find the muffin cups deep enough. These are pans we reviewed or tested which didn’t make our top 10 list. 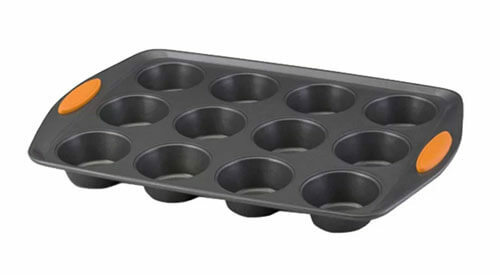 Keliwa 12-Cup Silicone Muffin-Cupcake Baking Pan – None of the silicone pans we reviewed made out list. However, of all the silicone pans we reviewed this was the best of its kind. Muffins came out easily, but of course the sides of the muffins lacked the browned exterior. OvenArt Bakeware Silicone – Same as the Keliwa but way more flimsy; to the point that it was annoying. Farberware Nonstick Bakeware – Currently discontinued so we removed it from our top 10 list and replaced it with FarberwarepurECOok Hybrid Ceramic. The Boston Sweets Silicone Mini Muffin & Cupcake Pan – While cute, it was flimsy and left our muffins smelling a bit like plastic. Muffin Pan Buyer’s Guide – What to Look For It? Muffin pan is one of the best kitchen tools widely used these days to make cupcakes, muffins, and other baked items. 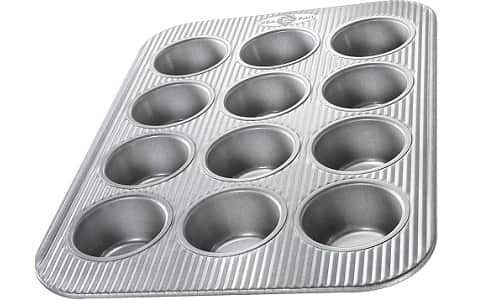 World’s first muffin pan was believed to be made of galvanized steel. 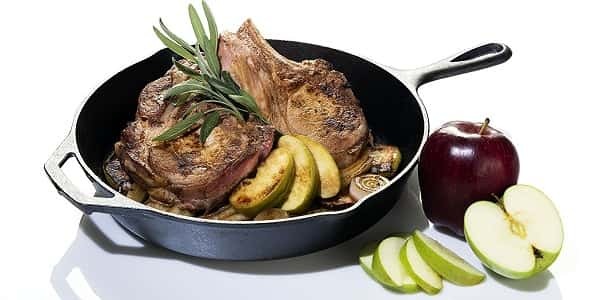 Later on, manufacturers started to use stainless steel, cast iron, aluminum and other rustproof materials to make these pans. Over time, many bakers started to look for ease of use. Hence, silicone pans and muffin pans now come with nonstick coating. 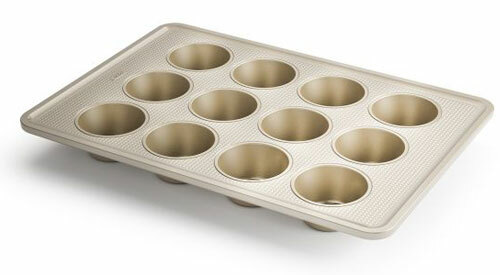 Now, you can find muffin pans in different yields and sizes according to the needs of bakers. To make bakery-worthy muffins, it is recommended to use a muffin pan which can hold up to 6, 8, 11, 12, 24, or even 35 muffins and yields 3.5 oz. of batter in each cup. If you want to make mini bite-size muffins, go for muffin pans which yield 2 1/8 oz. of batter and can hold 6, 12, or 24 muffins at a time. Similarly, go for muffin pans with 8 3/16 oz. of yield and 4, 6, or 12 cups of muffins. Usually, muffin pans are made of traditional stainless steel, aluminum or other metals that may stick and you may find it hard to remove muffins off their molds. So, some bakers have to grease their molds with lard, butter, or other fat, while some layer them with wax paper. In this day and age of eco-friendly materials and health concerns, paper layers and greasing are strictly avoided. To save more on production costs, paper linings are avoided also because of environmental concerns. It is because food-grade wax papers are made of pure wood pulp. For producing this pulp, thousands of trees are cut. These paper linings are of no use once you eat muffins. To deal with such concerns, bakers started using non-stick muffin pans. However, the first technology of non-stick coating was introduced a way back around 3000 years ago, when ceramic griddles were used by the Mycenaean Greeks in making bread, in which one side has mini holes to place the dough and one side was smooth. PTFE or poly tetra fluoro ethylene is also known as Teflon coating which is used in modern non-stick cookwares. Teflon is introduced by DuPont. Teflon is highly resistant to heat but it starts melting at 620F. Later on, PTFE coating have been developed with diamond-reinforced PTFE formula from Swiss Diamond International, non-reinforced non-stick PTFE formulation by Calphalon brand of Newell Rubbermaid, and titanium-reinforced formulation by Scanpan. According to the scientific researches, PTFE coatings start to melt at just 392F. It produces a lot of toxic fumes and chemicals like PFOA or per fluoro octanoic acid. PFOA was supposed to be persistent pollutant causing harm to our health and environment. Another major concern is that PTFE coating scrapes off of its surface. It is also likely to get into food. Due to improper cleaning and use, it scrapes off. So, manufacturers recommended using only wood, plastic or any PTFE-coated utensil with these pans. For cleaning, it is recommended to use non-abrasive cleaning tool only. In order to avoid the harmful effects of Teflon coating, various other technologies for nonstick surface were introduced. 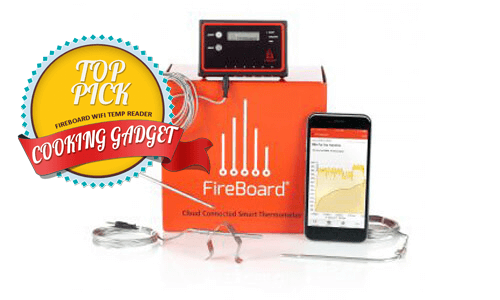 With these technologies, products are a lot more costly as compared to traditional ones. Some of the common examples are pans with several layers of metal sheets, ceramic-coated pans, pans with sandblasted coating of titanium-ceramic blend, and pans with diamond powder or tourmaline coating. You may also find heavy-gauge steel pans, anodized aluminum, and carbon steel pans. If you are worried about sticking food, you may also like cast iron muffin pans. They have slow heat conduction and are naturally non-stick. Its leaching nature adds extra iron to the food. But they are prone to rust with time. So, seasoning is required on timely basis. However, there are some complaints that silicon pans may break and are flimsy. But the softness makes it very easy to remove muffins off the molds. Just squish the pan lightly to pop out the muffins easily. You can also check my review for the best bread loaf pans. Muffin pans are today indispensable for every household. They are great when it comes to someone who loves muffins. However, it is true that you should take proper care of the muffin pan that you are using to bake the muffins. 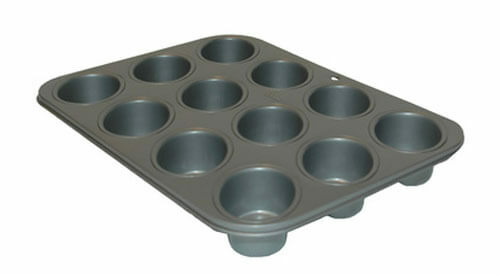 This article shall provide you a guide which will help you understand how should you use and care for your muffin pans. -} If you are using a non-stick type of muffin pan, you should always wash it properly before you use it. If it is the first time, you can wash the pan with soap and hot water. This shall go a long way in helping to remove all unwanted dirt and residues. -} While you are using the muffin pan, always use a material that is safe enough to be used in the muffin pan. For example, a steel spoon can leave the scratches or marks in the pan. So, avoid using the same. 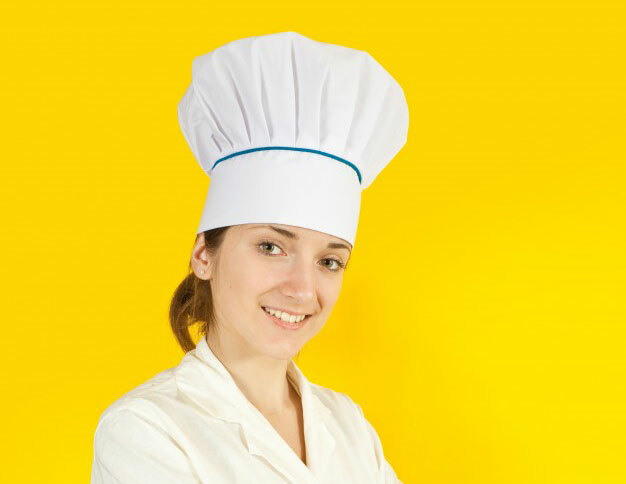 Some of the preferred utensils that can be used in muffin pans include wooden spoons, etc. -} You should avoid storing food in the muffin pans. This will damage the quality of the muffin pan. The reason behind this is really logical. Most of the foods that we prepare are acidic in nature and if you store them in muffin pans, the chemical so released from the food will interfere with the material of the muffin pan and in the process, it shall get damaged. Thus, it is clear from above, it is really easy to take good care of your muffin pans. This way, you will be able to use your pan for a longer duration. Most people use their muffin pans for baking cupcakes. While this works just fine, there is a slight difference between cupcake and muffin pans. The video below provides a clear look at what you can expect from a cupcake tin vs muffin. You may find lots of muffin and cupcake pans in the market. You have to do some homework to choose the right one. Be sure to consider the types of muffin baking you want to do, size of muffins you want, and materials you want. 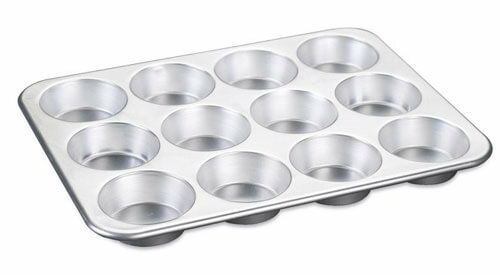 The best rated muffin pans listed above truly stand out of the rest which share many things in common and look similar. Customers swear by these products as they are affordable and made of high quality materials. Both startups and professional bakers choose these pans as they can make well-baked muffins and come from reputed brands. They are also backed by assurance guarantee and warranty for long working life. They are also easy to maintain and clean.